Asfia (centre, seated) with his committee members in a photo call prior to the press conference. KUCHING: Chief Minister Datuk Patinggi Abang Johari Tun Openg will lead the Sarawak delegation to attend a meeting with the Malaysia Agreement 1963 (MA63) Steering Committee to be chaired by the Prime Minister Tun Dr Mahathir Mohamad in Kuala Lumpur on Dec 17. This was announced by the Sarawak Consultative Committee on MA63 chairman Datuk Amar Mohd Asfia Awang Nassar during a press conference at the State Legislative Assembly (DUN) Complex in Petra Jaya here today. “Members of the delegation will be chosen by the Chief Minister,” said Mohd Asfia, adding that Sarawak has every right to pick its representatives. Mohd Asfia, who is Speaker of the DUN, said the Consultative Committee will serve as a vehicle to assist the Chief Minister and to advise the august House with regard to restoring the state rights as enshrined in the MA63. “We must make a strong stand speaking with one united voice for Sarawak. Failure to do so we may end up as voice of the voiceless. “In our approach, we must be history-guided and driven, legally logical and constitutionally right,” he said. Mohd Asfia said Sarawak “seeks to maximise and expand the common areas of agreement and minimise and narrow the margin of differences”. “We shall explore areas where we all can agree and areas where we agree to disagree. There are issues, for instance, on immigration where we consider as non-negotiable. “Immigration is non-negotiable. To concede on immigration is to open up the floodgate that would unease a torrent of immigrants from across the border and those far outside Sarawak to sweep away the Sarawak population. Sarawak ceases to exist. This is absolutely, completely and totally unacceptable,” he said. 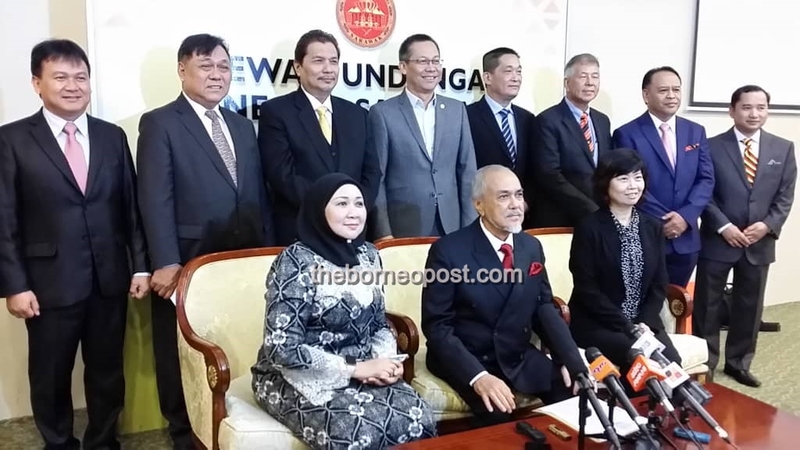 The Consultative Committee was formed under Standing Order 89 of the Standing Orders of the DUN and Article 24(1) of the Sarawak State Constitution though a motion dated last Nov 6. Its committee members comprise Minister of Tourism, Arts, Culture, Youth and Sports Datuk Abdul Karim Rahman Hamzah, Minister of International Trade and E-Commerce Dato Sri Wong Soon Koh, Assistant Minister of Law, State-Federal Relations and Project Monitoring Sharifah Hasidah Sayeed Aman Ghazali, DUN Deputy Speaker Dato Gerawat Gala, Assistant Minister of Youth and Sports Datuk Snowdan Lawan, Assistant Minister of Corporate Affairs Abdullah Saidol, Piasau assemblyman Datuk Sebastian Ting, Muara Tuang assemblyman Datuk Idris Buang, Tasik Biru assemblyman Dato Henry Harry Jinep, Batu Lintang assemblyman See Chee How, Bukit Assek assemblywoman Irene Chang, Tanjong Batu assemblyman Chiew Chiu Sing and Krian assemblyman Ali Biju.